First Impression: I have the “Auto Zone” jingle stuck in my head. Second Impression: And a sudden craving for frozen yogurt. Thanks, swirly font! Wait, his last name is Finger? With a name like that, he should have been a gynecologist, is a joke my mother would make. I would never make a joke like that. We like to keep it classy here at Thrift Store Fitness (burps, scratches self). At first I am very, very suspicious of this Finger, with his middle-aged long hair, unplaceable accent, and hemp clothing woven by sister wives. Is this a recruitment video? Was this filmed on a compound in an undisclosed rural location? 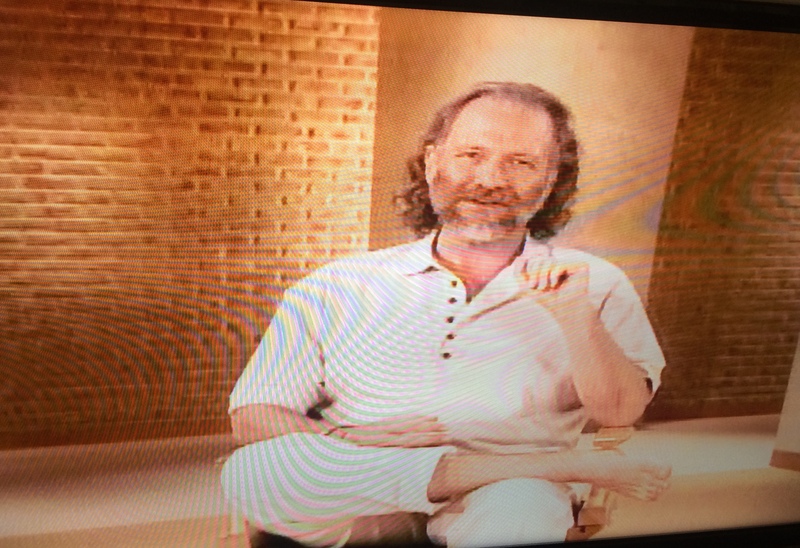 Is he trying to hypnotize me through the blurry, degraded VHS-to-DVD transfer? Then we ease into the workout and I’m immediately so relaxed, that I don’t care if I’m secretly being programmed to hand out pamphlets at a bus station, or serve organic carrot scrapings at the vegan co-op, which is actually a front for an international money laundering operation. You are in the presence of the Obi-Wan of yoga, so bow down. Out of respect, but also because we’re doing Forward Bend now, so shhh, pay attention. If you have tight hips in a cross-legged pose, Yogiraj Alan Finger recommends sitting on a Yellow Pages Book. Children, the Yellow Pages were a print-out of Yelp. A Book was a thing you accidentally left at your ex’s house and fretted about ever getting back. But that’s not the extent of Yogiraj Alan Finger’s arcane knowledge. While seated upon Ye Olde Book of Pages Yellow, he has us place two fingertips on our chin while looking down. This magically relaxes the back of your neck in a way that pharmaceutical companies have been trying to duplicate for decades. After an hour of relaxing poses, we wrap up with an extended relaxation session on the floor. I have no idea what happens in this part, because each time I do this video, I fall asleep, I mean, ascend to a higher plane of consciousness, escorted by Yogiraj Alan Finger’s kindly intonations. He may want to branch out into recording motivational sleep tapes for insomniacs, because they would be quite popular. This entry was posted in Reviews and tagged 60 minutes, abs, Celebrity Host, relaxing, yoga. Bookmark the permalink.